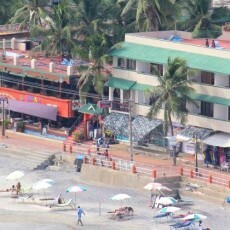 The Jeevan Beach Resort is located at Kovalam in Trivandrum. The Resort offers accommodation in 48 rooms of 7 categories. Rooms are mainly categorized based on the sea views: Pearl Sea View with Terrace, Wooden Suite, Exotic Sea View, Bay Watch, Sea Shore, Sea Shell, Love Shore. Multi-cuisine and multi-storied restaurant Cafeteria serves the best and most delicious recipes that suit your taste. The resort offers accommodation in 48 rooms of 7 categories. It has a swimming pool attached with children pool. It has a multi cuisine restaurant facing the sea. We have a Beer and Wine Parlour with snooker table. It also has a roof top yard provides a best sun set view point and a space to relax and sun bath at the beach away from the folk. Each rooms has own modern bathroom, TV, fridge, intercom, and free wifi. Pearl Sea View with terrace, Exotic sea view and Bay watch has the facility for seeing the sun set.